In my initial research in regards to the history of my mother’s Chamonix poster, I was mostly directed to Pinterest boards. There was no evidence of it being an advertisement of any kind, so I was led to believe that it was created solely as a decorative souvenir. Something to remind someone like my mother of the trip they took to France. However, I wasn’t entirely satisfied with these results, so I dug a little deeper. 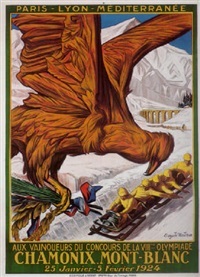 I typed all of the text from the poster into Google, “Chamonix, 80 ans de sports d’hiver,” in both French and English. This led to the discovery that the first official Winter Olympics were held in Chamonix in January of 1924. I was surprised that this information didn’t come up in my first search, since that seems to pretty noteworthy. I began viewing advertisement posters for those Olympic games, and the style of those posters were similar to my Chamonix poster. The art on this poster was done by an artist named Auguste Matisse, and a lithographic print copy of this poster is currently selling for close to $4,000. My jaw honestly dropped when I saw that. I’m sure my mother’s poster didn’t cost that much, which made me think these two posters were not as related as I originally thought. However, upon viewing these posters it is clear that they do hold some similarities. The fonts are very similar, as well as the view of the mountain in the background. I believe my mother’s poster was created with allusions to the style of the Olympic Games advertisement due to its popularity not only among people in France, but all over the world. As discussed last week, the lineage of this poster dates back about 35 years having first belonged to my mother. It was interesting to hear about the poster from her perspective, and it now means a little more to me than it did before. It was also interesting to read about the potential history of the creation of the poster, even though these are mostly speculations. The Winter Olympics in 1924 brought a lot of publicity to the small ski town of Chamonix, which probably contributed to my mother’s desire to go there 60 years later. I really enjoy nice things. Despite that I have often shared my experiences of living a rather minimalistic lifestyle throughout previous posts, the objects I do like to surround myself tend to exhibit a strong sense of value either through monetary or symbolic means. One such object that I highly value is my pair of Ray-Ban sunglasses that I have recently acquired about one year ago. When pondering on what my focus for this week’s blog post should be, I felt that diving into the physical nature, history and functionality of my sunglasses would offer an interesting and educational perspective that serves as a culmination to what we have learned so far during our honors seminar. My Ray-Ban sunglasses along with their case. For starters, I want to give to detailed description of what makes up my pair of Ray-Ban sunglasses. In terms of physical dimensions, the glasses are roughly 5 and a half inches long, 5 inches wide and are about 1 and a half inches in height. Moreover, the frame of the glasses has a nice black matte finish which gives the object a smooth feeling while also preventing fingerprints from emerging across its frame. On both sides of the frame, the Ray-Ban logo extrudes from the corners to help maintain the objects identity in regards to its brand and affiliation. I personally like the Ray-Ban logo on the glasses because I feel that it helps signify its quality as an object. Since I don’t tend to own too many objects, I like to feel reassured that the objects I do own have a purpose and possess quality in both design and worth. As a result, this logo helps to assure that this object is of excellent condition compared to other glasses on the market. A closer view of my Ray-Ban sunglasses. Continuing with the physical attributes of my Ray-Ban sunglasses, the inner corners of the glasses have a stainless-steel joint that allows the frame to pivot in order to open and close. Although the frame is a very important aspect of any pair of glasses, it is undeniable the most important portion of this object is centered around its lenses. For this object, despite of having a myriad of diverse lenses to choose from, I ultimately ended up with a lens with a metallic finish. Since standard black lenses were not available for the frame I had chosen, I ended up choosing these silver mirror lenses instead. Although I was a little skeptical of them at first, I eventually became very fond of them as they would soon become my everyday sunglasses. Before diving into the history of obtaining my object, I would like to touch on one critical aspect of these sunglasses that I have not mentioned yet – they’re prescription. I consider myself to be a generally healthy person but one area that I’m definitely lacking in is my personal vision; while I don’t have terribly bad vision, I don’t have the best vision either. Since I am near sided (meaning I can see clearer up close), and the fact that I don’t enjoy wearing normal glasses, I believed that obtaining a pair of prescription sunglasses would be a suitable compromise. I bring up this point because I feel as if this object perfectly brings up the debate of fashion vs function. I’m often surprised to how many people forget that sunglasses can be prescription and not just a mere accessory. One of the reasons I am drawn to this object is that it serves two purposes, it is a fashionable accessory while also allowing me to see much clearer. As a result, the pragmatic nature of this object is what led me to purchase it in the first place nearly one year ago. As I stated before, I obtained these sunglasses last June in Danbury, Connecticut at a local retailer called LensCrafters. Ray-Ban, being originally owned by Bausch & Lomb, were eventually sold to the Italian eyewear giant, Luxottica, in 1999. Moreover, since my glasses are made to order based on my prescription and have the writing “Made in Italy” on its frame, I tried to look further to see where exactly they were manufactured. Unfortunately, I was not able to locate any resources online that pinpoint the exact location in Italy where these glasses were made. However, according to Luxottica’s website, the company’s manufacturing footprint includes six facilities located in Italy, the center of Luxottica’s luxury eyewear production, with five of their most prominent factories being located in Northeastern Italy, where most of the country’s eyewear industry is based, and one near Turin. Although it is a shame that I wasn’t able to find to exact location of where my Ray-Ban sunglasses were manufactured, I’m sure they were produced with passion and exquisite Italian craftsmanship. With such a strong attention to detail, a pragmatic and fashionable purpose and a rich Italian history, there’s no surprise to why this object continues to be one of my favorite possessions. Perhaps one day I’ll have the opportunity to dig even deeper into the history and manufacturing process of these glasses. But for now, I look forward to continue wearing them as I will be able to appreciate and acknowledge this object’s significance, functionality and history. For this week’s post, I am once again focusing on my family ring: my Irish Claddagh ring. To reiterate, the ring is an object that has been passed down to me through the generations. It began in the possession of my great nana, gifted to her at the later stages of her life. After she passed, it fell into the hands of my grandmother who held onto it until I became of age at thirteen to become to official owner of the ring. This is a family tradition for all the girls on my father’s side of my family, meaning my sister also was given a passed down Claddagh ring when she became a teenager. However, after a recent family discussion, it came to my knowledge that the ring my sister possesses has a much richer family history than my own. Though I am a bit envious of the story behind her ring, I am grateful that I was able to ask my grandmother about it and delve into more of my family’s wonderful history. The ring my sister has traces back to–and I’m going to hope you can follow this, because it took me awhile to understand–my grandmother’s grandmother’s mother-in-law. So, in other words, the ring comes from the mother of the husband of my grandma’s grandma. I’m not sure if there’s a simpler term for that, but that’s what the text I received regarding the ring’s history says, and so that is what I will write. The woman who was the first owner of my family ring had been given it by her first fiancee as an engagement ring. He was an irishman through and through, and it had been his own family tradition to propose with Claddagh rings. The woman herself was not Irish, but seeing that she was about to marry into a heavily Irish influenced family, she accepted and wore it proudly. They were engaged for a few brief months until, sadly, the man, who I believe was named Angus, died suddenly. My grandma does not know the details of his passing, other than that the woman was utterly heartbroken. Though its appearance does not differ greatly from mine, it is a bit more tarnished and the band shows signs of bending and warping. It is amazing to me that stories such as the one I’ve told exist in my family. I have never been one to ask much about the history of my lineage. Rather, I’ve accepted that I come from a long line, beginning somewhere in Ireland many centuries ago. However, now every time I put on my necklace with my ring dangling from it, I am reminded of how rich my family history is and of how great of a story there is behind these little heirlooms that my sister and I carry around with us. I hope that someday, down the line, the ring that I pass down will accumulate a great deal of detail and stories to be told to future generations within my family. I don’t really have any items that have been passed down in my family, and so I’m lacking in an object that I can trace the chain of ownership of. However, I do have this book that I acquired a few years ago, and sometimes I like to ponder its chain of ownership. This book has an uncanny ability to capture my essence, my being, my spirit. Sometimes I think that this book and I were meant to meet, it feels as if it was made for me. It’s called 365 Ways to Save the Earth, by Phillippe Bourseiller. I’m incredibly passionate about environmental issues and have heavily involved myself in that world on and off campus—through internships, clubs, and attending community meetings and events. Environmental advocacy, whether through the channel of politics or communications, is one of the possible paths I want to take after college. I firmly believe in the issue of climate change and climate justice, and working towards a more sustainable future for everyone, but I also really just enjoy nature and being outside and soaking in the beauty. I bought this vast book for $1 at the Elting Memorial Library Fair during my freshman year here. I saw this book, laying among the rest, and it was an instant connection—I had to have it. The book’s bold cover, a clear photograph of a mother and baby whale swimming together in a melancholy blue ocean, and its thick, yet compact size is what caught my attention, and then of course, the title. I’m a big book lover, and a big earth lover, so this book seemed perfect. I immediately reached for it and was filled with joy, excitement, and appreciation. This book hits a deep chord for me, and I was inspired by the title, 365 Ways to Save the Earth, and already started to think of the kinds of projects I could do with it. The book is also reflective of the time in which I got it. I was a freshman, bright-eyed and bushy-tailed, with a lot of energy and an activist spirit—I wanted to take on the world, and this book seemed like a pretty good start. Once the book was in my hands, I wasn’t going to let it go, and especially finding out it only cost $1, it made it really easy to not let go. I was amazed. I felt like I was practically stealing the answers to the universe—for a $1! I couldn’t stop showing it off to people once I had gotten it, and I would find myself getting lost, flipping among the pages, carefully reading each tip and studying the photos. I still always have it with me today, and while I look at it less often, I always keep it by my desk, so I can see the cover and be reminded of that magical day, and reignite my passion. One could characterize this book as a “coffee table book.” It’s hefty, intriguing, and has a lot of pictures—easy for guests to peruse through. The book is filled with awe-inspiring and breathtaking photographs of nature—from volcanoes, to elephants, to glaciers, and sea slugs. Each page contains an environmental tip for each day of the year on how we can strive to live a more sustainable and environmentally-conscious life on one page, and a beautiful image on the other, showing us exactly what our actions could be saving. Some tips are easier than others–to reuse materials before buying new ones, or start a compost–and others are a bit harder–like switching the way your house gets energy. Some also call on us as citizens of our respective countries to put pressure on our politicians and demand change. One aspect that I really appreciate about this book is its global mindset—there are photos from all around the world, places you may not even known had existed, or parts of the world you never thought you would see. It also has a universal nature, anyone can relate to this book, even if some of the tips don’t apply to you or aren’t feasible, we can still appreciate the stunning photos of this world that we share. The inside of the book: an environmental tip (“Read and know your poultry labels”) and a stunning picture to match. A close up of a tip urging us to speak up. A close up of the adjoining photo–a true wonder. The book was published in Paris and New York in 2005. It was originally written in French. The photographs are a compilation of the photographer’s work, Bourseillier, over the past 15 years capturing nature from all angles (leaving no stone unturned). The book originally cost $29.95 in the U.S—I got it for a $1. I bought it used from the library fair, but it’s in really great condition, the binding has just become a little loose. I sometimes think why someone would give this (perfect) book away. There’s no note written in the front cover, as you sometimes see when buying used books. None of the pages are marked or folded. There’s almost zero trace of the past owner(s) or of human touch. Maybe it was owned by a couple who had it on their coffee table, but tired of the message. Maybe it was received as a gift, maybe someone had gotten all that they could from it, and wanted to spread the knowledge. Maybe someone had bought it second hand before I did. Maybe the person knew the photographer and had multiple copies. But I wonder, how did this beautiful book make its way to the Elting Memorial Library Book Fair in New Paltz, NY, during the fall of 2015, and make its way now into my possession? I wonder how long I’ll hold onto it, if I’ll ever donate it (probably not). Maybe I’ll give it to one of my children, if they’re environmentally inclined, and perhaps spark a passion that my mom sparked in me. This week I decided to discuss my copy of “Mastering the Tarot: Lessons in An Ancient, Mystic Art” by Eden Gray. Originally published in 1971, this copy was purchased by my mother in the late 90s at a used bookstore outside of Washington, DC, where I grew up. The neon green price tag reading “McKay Books” remains on the front cover; I spent many afternoons at this bookstore as a kid and have fond memories of purchasing some of my favorite books from there, so I have yet to peel off the price tag after all this time. There’s no way of knowing who the previous owner of this book was, though I’ve often wondered who may have “mastered the tarot” before donating it to McKay’s. I think that’s the beauty of used bookstores; you always carry a bit of someone else’s history–and the mystery that accompanies this–in the pages of your newly purchased book. My mom has dabbled in Tarot since she was a teenager. She picked up the hobby from my late grandmother, who always had a great passion for mysticism and spirituality. My mom purchased this book to accompany a new set of cards my dad had given her as a gift. She used the book on and off for years until it ultimately began collecting dust on the bookshelf in our living room. Coincidentally, I took up an interest in tarot in my teenage years (runs in the family I guess) which prompted my mom to give the book to me. Like most things my mom has given me, I feel a special connection to the book–especially because it represents something we have in common and an activity we often do together. We’ve spent countless summer nights sitting at the dining room table reading each other’s cards while my dad teases us for taking it so seriously–these moments have become significant parts of my late teens and early adulthood years. The book is certainly well-worn (or well-loved, as I like to see it). When my mom first gave it to me about 4 years ago it was in decent condition, save for some creasing on the front cover and some tears on the edges of the pages. I’ve since gotten quite a bit of use out of it, eventually resulting in deeper creasing, some paint stains (not quite sure how those got there) on the upper right corner and broken binding. I tried somewhat successfully to patch it back together with duct tape (you can see that not all the pages are reattached to the binding) but it gets the job done. Inside the middle of the book you’ll find a folded up sheet of paper; a few years ago I drew up a key for myself to remind me of the basics of the Celtic Divination layout (a standard card reading method). I’ve kept this sheet of paper in the book for so long now that I consider it a part of the book itself. It’s sort of my way of making the book my own. The Keltic (spelled with a K in Tarot lure) Divination method with my personal notes about certain card meanings. Writing this blog post made me realize how much of a constant this book has been in my life. It reminds me of the invisibility of objects; I’ve always known the book to simply be, whether it sat on my mom’s night stand at our old house in Virginia, on the bookshelf in our living room in upstate New York, or now on my own night stand at my house here in New Paltz. I’ve turned to it many times when I needed a sense of guidance about my future; I can’t count how many times my roommates and I have sat on the floor and read our cards in hopes of receiving some “divine” advice from the universe about how the heck to get through college. I’m grateful to have had this tradition passed down along family lines, especially since I never got to meet my grandmother on my mom’s side. Assuming I can keep the book in one piece over the years (we’ll see), I’d like to pass it down to my kids one day and keep my family’s fascination with the weird and mystical going for a few more generations. I have claimed in the past that I have no family heirlooms. I guess whether or not that is true depends on what one considers an heirloom to be. I don’t have an object that represents my heritage or culture and has been passed down for generations. I think a reason for this lack of cultural object has to do with the fact that no one in my family has immigrated here recently, my parents, grandparents, and even some of my great grandparents were born in the United States. However, I came to the realization recently that I have a ring that was given to me by my grandmother. She received that ring from her grandmother. I am the oldest granddaughter on my dad’s side of the family, for this reason, I was the recipient of a small, golden ring with two diamond shaped gems, one clear and one red. This ring is the right size for a relatively thin pinky or a eight year old girl’s finger. Luckily, I was eight when I was given this ring, and currently, it still fits on my pinky finger. I received this ring for the religious sacrament know as Communion in the Catholic religion. Unlike a cross to a baptism or a ring to a marriage, a ring holds no relevance to the ceremony of Communion. However, this ring became something of a religious symbol, as my grandmother also received it as a Communion gift. Unlike the necklace from my grandmother I wrote about in my last post, which I wear every day, I have never worn this ring. However, I always make sure that I know where it is. I am very nervous about losing this ring. My fear changes the function of it from being a piece of jewelry meant to be worn, to a memento of a religious sacrament and of my grandmother. I would like to make this ring an heirloom for my family in the future, something to be passed down through generations to come. I do not know if the ring will continue to be passed down for one’s Communion, but my hopes are mainly just for it to be passed down in general. I know little about the origins of the ring. I know that it was purchased as a gift for my grandmother, and not originally owned by her grandmother. My grandma received Communion when she was eight, sometime in the 1950’s. Meaning that the ring was purchased around this time. My grandma then kept that ring with her all throughout her childhood and adult life. She decided to hand it down not to her daughter, but to her granddaughter. After receiving this ring, I immediately gave it to my own mom to hold onto for me until I grew older. Around age seventeen, my mom and I were going through the jewelry in her closet and we found the ring. She told me how I had received it and returned it to my custody, nearly ten years later. From then on, I kept the ring in the box in which it was given to me, which was not the original box. I bring the ring with me to wherever I reside at the time. There it remains, unworn, in a box. This blog post was very difficult for me. I don’t really have many objects that have been passed down throughout my family and have a “chain of ownership.” However, as I was reading back through last weeks blog posts I thought of the only object that I remember my mom telling me that has been passed down through the years. I responded a little bit in a comment, but these are little recipe cards that my family still makes around the holidays that they are associated with. It has become a tradition in my family. We always have my grandma’s quiche Christmas morning, my Nana’s sugar cookies and “butterscotchies,” also at Christmas, and my Nana’s ambrosia salad at Thanksgiving. Unfortunately, I could not get a picture of these cards because my mom is currently visiting my grandparents and these index cards are at home. Also, these recipes are very secretive in my family and so when I called my grandma to get these recipes she did not want to send a picture of the recipe itself. The first one that I’m thinking of is my Nana’s (great-grandma) Ambrosia salad recipe. Although, my grandma believed this recipe actually started with her 98-year old aunt. This recipe stuck out to me first because it is probably the most “secretive.” My mom used to tell me that my Nana never gave out this recipe until she got older. She would only make it for the family; however, would never give anyone in the family this recipe. Once she got older, she finally revealed her secret and passed it down to the rest of us. I’m glad she did because my Nana passed away before I was born and so this recipe is a piece of her that I will have for the rest of my life and be able to pass down to my own kids, when they’re old enough of course. The next recipe cards are oriented around our Christmas traditions. These include my grandma’s quiche recipe and two of my Nana’s cookie recipes that we make every year. These traditions started on my mom’s side of the family with all of her relatives; however, even after my parents divorced my dad still makes quiche for my brother and I every Christmas and my mom always makes my dad a batch of the butterscotch cookies for us to bring over. Something that I like about these recipes though, is that even though they originated with my family as these special recipes they have changed over time within my family. When my aunt makes the butterscotch cookies she always adds peanuts to them (as the original recipe calls for), yet when my mom makes them she leaves out the nuts because she doesn’t like them as much. Also, the quiche recipes change slightly from year to year to. The base and basics always remain the same; however, sometimes we change what else goes in them. My mom’s new boyfriend hates onions and so now when she makes the quiche she leaves out onions in one of them, so we can all enjoy it. Although, these index cards don’t seem like much, they mean a lot to me. I love cooking, if I wasn’t currently in college on a criminal justice/ law path, my second plan was to always go to culinary school. These cards are tiny and worn down and constantly changing, yet they’re one of the very few traditions my family treasures and still participates in every year. It’s not a crazy chain of ownership, but every member on my moms side of the family holds these recipes and continue to pass it down. There’s no real historical significance to these cards; however, to my family the history of these recipes is priceless. I feel that I have gone through the history and significance of my first edition copy of Little Men, at least as much as I can without the specific details of where it was purchased and who owned it previously, as this is difficult to do without it being a family heirloom. However, I am still greatly interested by the history of books and so I turned to the rest of my collection to see if I could dive into another book’s history. I looked for books which had previous owners’ names or dates inscribed inside. Though many of my books do have these details, I found myself most taken with a four specific books, of which I had forgotten their relation as I have owned them for several years now. These four books–Rose In Bloom, Old-Fashioned Girl, Under the Lilacs, and Eight Cousins–have many things in common, as well as with most of my collection. They are all written by Louisa May Alcott and published by the Roberts Brothers. Rose In Bloom, printed in 1893, is bound in a dark brown cloth with black lettering and floral designs on the front and black, brown, and gold lettering and accents on the spine. Eight Cousins, printed in 1888, has the same brown cloth binding but with gold lettering and black floral design on the front and black, gold, and red accents on the spine. Old-Fashioned Girl, printed in 1892, is bound in a lighter brown cloth with black lettering and floral design on the front and black and gold accents on the spine. Finally, Under the Lilacs, printed in 1892, is bound in green cloth with black lettering and design on the front and black and gold accents on the spine. These four books were purchased together as a gift to me by my grandparents, who also love books and antiques and are always on the lookout for specific ones that would fit into my collection, such as this author or publisher. They were found in a large antique warehouse (from what I remember) in Pennsylvania. They had said this place housed items for anyone’s interests and was a treasure trove for hidden collectibles, as most of their items were from estate sales or the clearing out of large collections. Because my grandparents were buying all four, they were not very expensive and was a substantial edition to my collection. Though “from” different people, the handwriting makes me think they are both written by the same person with the same type of fountain pen and so probably written by just one of the parents. The other two titles do not have one of these messages, but rather a first and last name written in pencil in the same spot. The first name clearly reads Carrie, though after much effort I still cannot confidently make out the last name, though in Eight Cousins there is a middle initial ‘L’ also included. I am pretty confident that it was Carrie who wrote the names in these two books as one of the reasons I cannot make out the last name is due to the pencil handwriting not being very clear. Additionally, the letters, though I can tell it is the same last name, are made in slightly different script styles. This possibly indicates a couple year difference in when they were written and therefore the child having more practice or development of her handwriting. While it is disappointing I cannot make out the last name, I am also unsure of how much more information I would be able to find on her or her family. She probably would have been married young and taken another name and I do not have the first names of her parents. However, I enjoy the idea of having a unique collection within my collection, and it brings to mind many questions I have about both her and the books’ lives since her ownership. I can tell, unlike my copy of Little Men, that these books were well read from the wear of the spine, cover edges, and the inner seams of the pages being loose and showing when opened. I do wonder of what financial means this Carrie girl and her family were, if she were spoiled and these were frequent gifts of which there are a few remaining. Or, if her family had to save for these and were only given for special occasions throughout her childhood. I also wonder at what point she parted with them, and if there were other Alcott books of hers that have since been separated. Or, even, how many owners they had before they became property of the antique warehouse, then of my grandparents, and now of mine. For this week’s post, I decided not to continue discussion of my grandmother’s old recipe book; there is not a very substantial chain of ownership, and when I asked my mother, she was uncertain as to whether the recipes themselves had been passed down or if my grandma simply made them up on her own (or, possibly, just copied them out of a cookbook)! Instead, I am going to focus on an object that I forgot even existed until this week (after a great deal of time spent bothering my mom, asking if we had any other heirlooms): the family bible. I do not currently have possession of the family bible, but it was the object I was able to discover the most history about, as it literally holds a record of the history of my mother’s side of the family back to the 1800’s (albeit a limited history of names, and the dates of births, marriages, and deaths). After my grandfather passed away, my Aunt Linda, my mother’s oldest sister, took possession of the family bible and provided me with some information and photos about it for the sake of this post. When I have the time, I would be curious to go to her house and see it in person (apparently I have seen it before, when I was very young, but I do not remember). Pardon the quality of some of the pictures – my Aunt Linda is technologically challenged and did her best. The duct tape is an unattractive necessity; it takes away from the overall fantastical and grandiose appearance of the family bible, but was put on by my grandfather when the book started to fall apart. The bible was bought and started by my grandfather’s parents – William and Myrtle Johnson, my great-grandparents – in 1912, the year they got married. They were able to document back as far as William’s great-grandfather, Theodore, and his marriage to a woman named Martha Cosgrove in 1869. In terms of births, my great-grandparents were able to trace the Johnson lineage as far back as Stephen Johnson, who was born in 1798. After my great-grandma passed away, the responsibility of the bible fell to my grandpa and grandma, and after their deaths it fell to my Aunt Linda. Interestingly enough, the deaths of my grandma and grandpa are not written on the Deaths page, even though they both passed away quite a few years ago; Aunt Linda told me she could not bring herself to do it. My mom said perhaps one day, when she is over, they can do it together. The more recent births and marriages within the large Johnson family could not fit on those pages and my Aunt Linda had to start writing on additional loose papers that she keeps with the family bible. This item did not necessarily have a very extensive chain of ownership – only one generation more than the recipe book – but I felt that it unearthed so much. I am a Cavallucci, not a Johnson, and I have always identified more strongly with my father’s Greek and Italian side of the family, but I had never known very much about my mother’s side. It is both astonishing yet deeply bizarre to see your heritage written down, and the sheer number of people within the Johnson clan. The family bible actually inspired one of my older cousins to delve deeper into the Johnson lineage using Ancestry.com a number of years ago, revealing supposed connections to infamous horse thieves and even ancient Scottish royalty. I was young when he did this research and was disinterested at the time, but am certainly much more interested now to learn more about the people upon people that are my ancestors. Although this book only contains names and dates, I loved learning about it as I gathered information from my aunt and my mother for this week’s post. I love seeing how the handwriting on the pages changes as the family bible was passed down – a testament to its continual inheritance. Heritage and family history are something that I have become quite fascinated with in recent years, and the family bible is something I think I hope to have one day, and to write and record the legacy of our family in, ugly duct tape and all. The object will continue to be weathered with time, but as my mother jokingly told me of the family bible: nothing can break the bonds of family. For this blog, I have decided to look deeper into the chain of ownership of the Hoosier hutch in my dining room. Before diving into my research I thought about how exactly I would do this, and how would I be able to learn more about it. Since the hutch is rather large, I can only imagine how difficult it would have been to move such a large object. Therefore, there must be a story somewhere in my family telling about its travels. However, since all the relatives who have had previous ownership of this hutch have since passed away, tracing it back without their help might be very difficult. This hutch was originally manufactured in New Castle, Indianna. When researching more about the production company, I discovered just how popular these cabinets were. According to Radford (2013), one in every ten homes in the U.S. had Hoosier kitchen cabinets by nineteen-twenty-one. Most models were designed so that they could be an all in one kitchen work station and storage. Some models had mixers, flour sifters, and baking ingredient specializations. Somewhere in this company’s fourty year business, my great-great-grandparents purchased a specific model of these cabinets. Their cabinet is a right facing one, model number 6001-SGO unit, which is a bit different from the other popular models. It has five shelves, and air flow holes in the top and bottom so that baking supplies will not get stale. It was shipped from New Castle, Indianna to Hazelton, Pennsylvania, where my great-great-grandparents lived. While I do not know much information about when it was ordered, or how it got to their home in PA, I do think that it was used for baking and kitchen storage. A possible missing link in how this hutch went from my great-great-grandparents to my Poppa, could be through his parents or my great-grandparents. However, this would have meant that the hutch traveled to Brooklyn, New York, which is where my great-grandparents lived and where my Poppa grew up. This sequence in the story, could most definitely be true, and could explain why it had been continually passed down. Having said that, I do know for sure that this hutch traveled to Endicott, New York, at some point over the years, and this is where it remains. It has been in the same house since its arrival here years ago, and has only moved rooms. Since moving into my grandparents house, almost fifteen years ago, this hutch has been in my dining room. My mom and dad cleaned it up, and brought it back into our dining room. Since it had been moved into the basement where my Poppa used it for tool storage. When I asked my mom for more information, she said her sisters had a hard time deciding who would keep what furniture and other objects that belonged to my grandparents including who would keep this hutch. It was then decided that this hutch, along with a couple other pieces of furniture would stay in the dining room of the house, and this is where this hutch remains. It is now overflowing with baking supplies, like sprinkles, chocolates, containers, aprons, sugar, flower, pots and pans. This is how I’ve always remembered the hutch looking, but now I’m glad that I’ve learned more about it, and how just as our family has moved and changed, so has this Hoosier hutch.